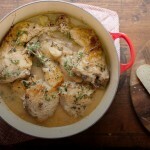 Chicken with Forty Cloves of Garlic is a classic French dish that celebrates the sweeter side of garlic. It’s cooked slowly to mellow the pungency of garlic and sweeten its flavor. I’ve made Chicken with Forty Cloves a countless number of times, and each time I’m reminded of Ina Garten, whose original recipe is where I adapted my own version. This recipe, as is the recipe that it was adapted from, has lots of sauce for ladling onto couscous or drowning pieces of a lovely baguette into. Over the years, I’ve developed my own methods in the preparations of this dish. Namely, I begin by pouring myself a glass of wine, reserving the rest of the bottle for the sauce. I consider it the cook’s reward for making dinner; which by the way, if you’re making this, —is going to be fantastic! If you were cooking with others, it would be a good idea to have a few extra bottles on hand so that everyone can have a glass as they cook. Actually, it’s generally a good idea to have a few extra bottles to serve along with dinner. Peeling garlic can be an arduous and miserable task. Thankfully, removing the skins is made easy with the help of some boiling water. You simply add the garlic to a small pan of boiling water. Allow the garlic to bubble away in the water for about a minute, after which, you rinse the cloves under cold water. The skins blister and make peeling a breeze. Butchers don’t always cut away the excess fat from chicken leg quarters. Using kitchen shears can make quick work of this task, but naturally a knife would work just as well. Cut away the excess fat from the underside of the thigh and toss it out; the chicken skins alone are fatty enough. At this point, you can decide if you divide the quarters into halves and separate the leg from the thigh if you wish. Though, I often leave the leg quarters in tact. Unbrowned chicken skin is not appetizing. Browning the chicken not only to make the dish look more appetizing, but it taste much better as well. The brown bits at the bottom of the pot after browning add an immense amount of flavor to the dish and the skins render fat to flavor the sauce. Pour yourself a glass of wine. Enjoy slowly and reserve the remaining wine for the sauce. Proceed to peeling the garlic. Peel the garlic by placing them in a small saucepan of boiling water for 1 minute. After which, drain the water and rinse the garlic in cold water. The peels should then be easy to peel. Set the peeled garlic aside. 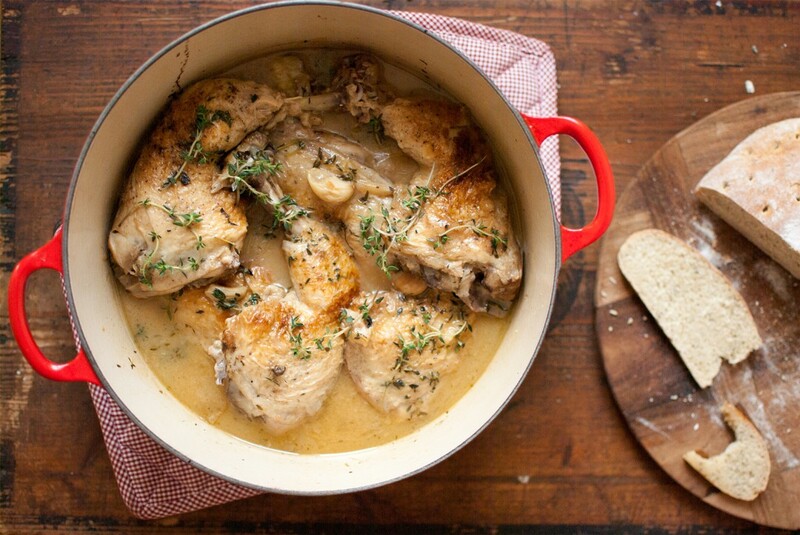 Lightly season the chicken with sea salt and pepper and set aside as you heat your pot. Heat 2 tablespoons of olive oil in a heavy-bottomed 6-quart pot, over medium-high heat. The pot just needs to be large enough to fit the chicken and most of the bottle of wine. Once the pot is hot enough, brown the chicken, skin side down first, working in batches until all the chicken pieces have browned. Place the browned chicken on a plate and set aside. Add the garlic to the pot and cook them until they are lightly golden-brown, about 3-5 minutes. Once they have browned remove them and place them back into their bowl. Use a wooden spoon and stir the flour into the pot of the residual oil and cook for 1 minute. Then, slowly stir the first few glugs into the flour to start the sauce. As the wine thickens from the flour continue pouring most of the wine into the pot, leaving enough the wine in the bottle to pour a glass for the cook. Add the garlic, 1½ teaspoons of sea salt, ½ teaspoon pepper and the thyme to sauce and stir. Next, return the chicken pieces to the pot along with any of the juices that have collected on the plate. Reduce the heat to medium and cover. Cook the chicken for about 1 hour. Serve hot with cous-cous, rice or pieces or baguette. This reheats wonderfully. Consider making this the night before for dinner guests.